SFC David James Salie was killed recently when an IED exploded near his Humvee during a patrol in Baquba. Units from the 3rd Infantry Division launched from the gates of FOB Gabe at 4 a.m. this morning to capture or kill persons responsible for his death. 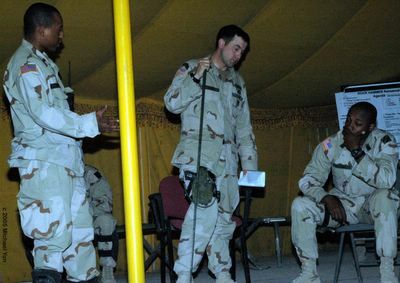 During pre-mission planning, Captain Bobby Toon, a former Army Ranger and veteran of the combat in Mogadishu, prepared his men for bloody fighting in Buhriz, one of the most dangerous areas of Baquba. These men were from David Salie's platoon, and they had also been attacked the day he was killed. The mission might result in serious friendly losses, Captain Toon explained, but the objective was clear: to capture or kill specific terrorists who were seeking refuge in the bowels of Buhriz. The men were eager to fight. Normally it is easier and safer to kill terrorists than to attempt capture. US forces knew where some of the terrorists were living, and could have dropped bombs on their homes. But as one soldier told me, "A terrorist in hand is worth ten in the grave." So even knowing they faced greater risks in the attempt, they were going in to capture the terrorists. Failing that, they would kill them. Just before sunrise, the Army rolled into the twisting warren called Buhriz, and cracked the day open with artillery shots into an adjacent palm grove, believed to be where the terrorists made their IEDs. When the soldiers came to their targets, they kicked or blew open gates and doors, rounding up dozens of men, most of whom were interviewed on the spot. I watched as many people in the neighborhood, in house after house, volunteered information that proved accurate in capturing enemy weapons and explosives hidden nearby, including one large IED that was rigged and ready. The Iraqis also freely offered information, albeit on condition of anonymity, on the whereabouts of the raid's main target, Saddam Septi. Several residents worried that Septi would kill them if he knew they had talked. The soldiers combed the palm grove over the next few hours, finding several weapons and explosives caches. Back in the warren, as the sun rose higher in the sky, children began peeking out of doors and windows, until finally they were playing in the streets and waving at soldiers, who departed in the afternoon with eleven hooded detainees: six who had tested positive for explosives residue.